The water soluble ink in the pens easily removed with a damp cloth or by spritzing with water. This package contains one pen; Available in a variety of colors: each sold separately. 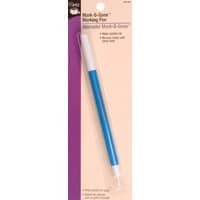 The marking pen is used to transfer pattern marking, needlecraft & quilting designs.